Wear Your Superheroes on Saturday! We’re pleased to announce that Wear Your Superheroes Day is returning for a third installment this Saturday, October 1! To participate, you can start by RSVPing on our Facebook event page and sharing it with your friends. Then, on Saturday, post a photo of yourself (and family/friends) in your favorite superhero attire. You can also share your picture on Twitter and Instagram using the hashtag #WearYourSuperheroes. Whether it’s a t-shirt or a full costume, we’d love to see it. Let’s once again show the world that superheroes are for everyone! Wear Your Superheroes Day is Tomorrow! Wear Your Superheroes Day is back! Last year we shared the story of Leanna, a five-year-old girl who loves superheroes but was teased at school for wearing her superhero clothes. Her older sister Adalina promptly declared October 1 to be Wear Your Superheroes Day, when boys and girls who believe superheroes are for EVERYONE could show solidarity by wearing their superhero gear. The event was a tremendous success, both at the girls’ school and online, where we had more than 1,800 participants from the U.S. and around the world, including Australia, Brazil, Canada, Chile, Germany, Spain, and the United Kingdom (to name just a few countries). Since that day, Leanna has been much more comfortable with sharing her interest in superheroes, and better yet, we’ve heard from parents of other kids who have been encouraged by her story and by the many photos and messages that were shared by others on Facebook and elsewhere online. This year, we’d like to keep the momentum going. On Thursday, October 1, please join us by wearing your favorite superhero attire and sharing your photos to our Facebook event or on Twitter/Instagram with the hashtag #WearYourSuperheroes. Whether it’s a full costume that you designed or something simple like an accessory to go with your work clothes, we’d love to see what ideas everyone comes up with! In the meantime, please help us spread the word by sharing the Facebook event page! You can also connect with us on Facebook, Twitter, and Instagram. Thank you! We’re pleased to announce the winners of the 2014 Wear Your Superheroes Halloween Costume Contest! 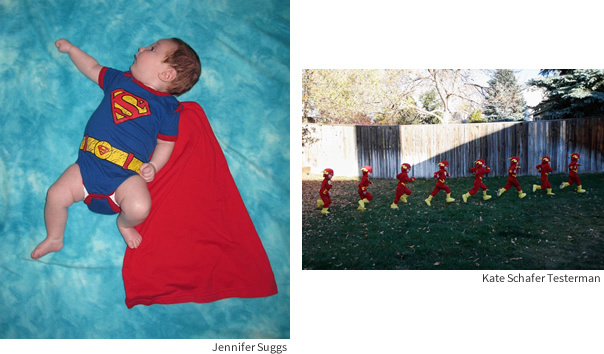 The winner of the “People’s Choice” prize, a $50 code for merchandise at Zazzle.com, is Jennifer Suggs, for her photo of her three-month-old son in a Superman costume. The winner of the “Best Children’s Costume” prize, a free Super Blanky™ from SuperBlanky.com, is Kate Schafer Testerman‎, for her time-lapse photo of The Flash. Unfortunately, there were no “Best Local Costume” prize winners due to a lack of eligible entries. Announcing the 2014 Wear Your Superheroes Halloween Costume Contest! We are pleased to announce the 2014 Wear Your Superheroes Halloween Costume Contest, which we hope will be the first of many! 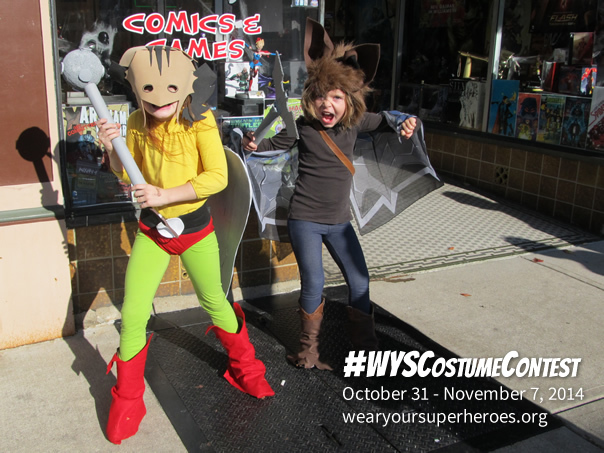 To participate, simply post a picture of yourself (or your child) in your superhero-themed costume to the Wear Your Superheroes Facebook page, along with the hashtag #WYSCostumeContest in the description, between Friday, October 31 and Friday, November 7, 2014. Thanks to the generosity of our supporters, there will be prizes! The “People’s Choice” prize, a $50 code for merchandise at Zazzle.com, will go to the person whose photo receives the most Likes between October 31 and November 7. The “Best Children’s Costume” prize, a free Super Blanky™ from SuperBlanky.com, will be awarded for the child’s costume (for a child 12 or under) that we select for being the most creative and well executed. In addition, we will be giving away three gift certificate prizes to the top entries in our “Best Local Costume” category, which is for people in the Greater Cincinnati area. Anyone who wants to participate in the local contest should also use the hashtag #WYSCincy and must be a resident of Ohio, Kentucky, or Indiana. The first-place winner will receive a $25 gift certificate for Arcadian Comics & Games in Newport, KY, and the second- and third-place winners will each receive a $10 gift certificate for Arcadian. As an added bonus, Arcadian has offered a free comic book for anyone who participates in our contest, while supplies last. All you have to do is stop by their shop (627 Monmouth St., Newport, KY 41071) and show a picture of your costume entry within 30 days of the end of the contest. Even if you’re not wearing a superhero costume this Halloween, we encourage you to get sneaky! If you find a subtle way to incorporate your favorite superhero into your costume (for example, a superhero logo on your princess or firefighter costume), please share it! For complete details about the contest, please refer to the Official Contest Rules and Regulations. Please note that for legal reasons, this contest is open to United States residents only. If you’re located outside the U.S., or if you don’t want to participate but still would like to share a photo of your superhero apparel, feel free to post your picture to our page and just omit the hashtag. You can keep track of all the photos posted to our Facebook page by going to the “Photos of Wear Your Superheroes” album page. We also invite you to share your photos on Twitter (@WearSuperheroes) and Instagram (@wearyoursuperheroes), but please note that those photos will not be considered contest entries, as this is a Facebook-only event. Thanks for your continued support! Have a safe and fun Halloween! Thank you for an amazing day! We’re not done! 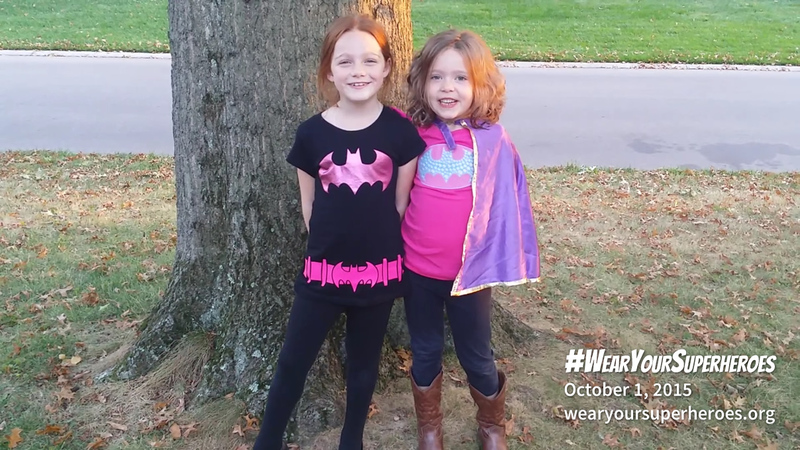 To everyone who shared their #WearYourSuperheroes photos and words of encouragement for Adalina and Leanna: Thank you so much! To say that we are overwhelmed by your response would be an extraordinary understatement. Although I don’t think they totally understand the impact that their idea had, or just how many people came together to support them, I can say with certainty that the girls had a blast today. More importantly, you helped us achieve our goal of enabling Leanna to “wear her superheroes” with confidence! After talking with her this evening, I realized that she didn’t see this day as being about her. It was simply a celebration. She told me that she was excited that everyone got to dress up as their favorite superhero, and I could tell how happy she was that there were so many other people who share her interests. Today was a lot of fun for us grown-ups too, and we’ve had several people tell us that they’d like to do this again, so that’s what we’re going to do. Since this page is just for a one-day event, we’ve created a separate Facebook page called Wear Your Superheroes that we’ll be using to coordinate future events and share even more photos and stories. Please “like” it so we can stay in touch! We’re also going to maintain the Wear Your Superheroes website, which will continue to display #WearYourSuperheroes photos, as well as our accounts on Twitter (@WearSuperheroes) and Instagram (@wearyoursuperheroes). Our immediate plans are to do something fun for Halloween, and we also want to make Wear Your Superheroes Day an annual event. However, if you’re celebrating an event of your own, or if you want to show off a costume you’ve created, we invite you to share your photos with us at any time! Thanks again for making this a fun and uplifting day! Join Us Today for Wear Your Superheroes Day! Participating is easy: Just join our Facebook event, wear something with your favorite superhero on Wednesday, October 1, and then share your photos with us on Facebook, Instagram, or Twitter! Please post your photos using the hashtag #WearYourSuperheroes and tag us too (@WearSuperheroes on Twitter, @wearyoursuperheroes on Instagram, event page on Facebook). If you use the hashtag on Twitter or Instagram, you should be able to see your photo in the right sidebar on our website. Unfortunately, it doesn’t appear that there’s a simple way to display photos from the Facebook event page. 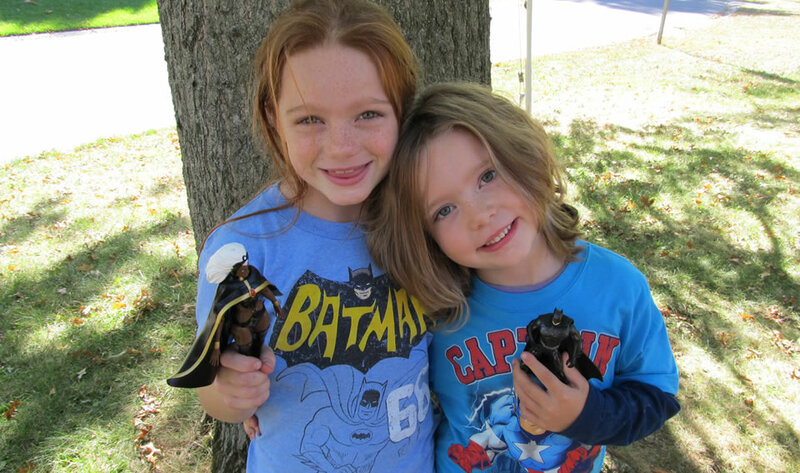 Her seven-year-old sister Adalina has declared Wednesday, October 1, to be Wear Your Superheroes Day. Boys and girls of all ages who believe superheroes are for EVERYONE should wear their superhero stuff on Wednesday and post a picture with the hashtag #WearYourSuperheroes. Solidarity! Share the event on Facebook and Twitter to spread the word! Wear Your Superheroes © 2014. All rights reserved. Website (super)powered by Midwest New Media, LLC.